We’ve heard that breakfast is the most important meal of the day, but lunch is the most fun! Nothing turns around a plain day at work like an awesome mid-day meal! Whether you come alone or bring the office, our huge lunch selection has something for everyone! Our lunch specials are delicious and very filling! Start with one of our hearty wraps or sandwiches. Then add a cup lobster bisque, chili, or any of our delicious soups of the day, or add one of our delicious salads with your favorite toppings. We want to hear your Bagel Bakery story! Since The Bagel Bakery opened in 2000, hundreds of Gainesville residents have come to know Bagel Bakery as their favorite breakfast spot, hangout space, “second home.” To celebrate 15 years of The Bagel Bakery, we want to hear some favorite memories about the bakery. Send your stories and a picture to mary@greenbergcommunications.com to be featured on our blog and Facebook page. There is something so enjoyable and intimate about sharing a great meal with friends. A simple breakfast or lunch can spark the greatest conversations and create a strong bond between new friends. 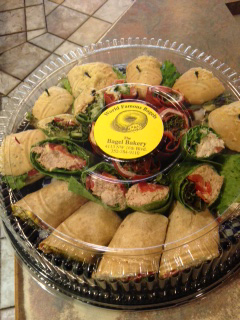 The Bagel Bakery’s beautiful platters are perfect for office meetings, parties, social gatherings, philanthropy events, and brunches. Choose from a variety of our platters, all of which are absolutely delicious and beautifully arranged on a covered tray. Order a platter today for your next event!